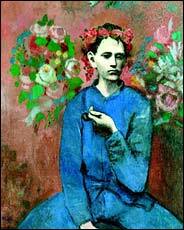 The $104.1 Million Picasso that was auctioned off at Sotheby yesterday. The only board game I bought myself is called “Modern Art”. It simulates auction houses competing for arts. I was introduced to the game by an enthusiastic young couple during a ski cabin weekend up in north Tahoe. What¡¯s intriguing about the game was the dynamic of an auction market. There was no telling what could happen to any of your ¡°art holdings¡±. Each player¡¯s personality and the dynamic created by the group could produce unexpected market trend. 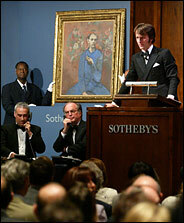 Here is a picture of Sotheby during the auction of this painting.